Load checks in a flash! What kinds of checks can I load? How do I take a picture of a check? Why wasn't my check approved? Why can't I register in the Ingo Money App? You can submit most check types for funding approval in the Ingo Money App, from $5 up to $5,0001 . This includes payroll and government checks with a pre-printed signature, business checks, two-party personal checks, handwritten payroll checks, insurance checks, attorney checks, cashier's checks, money orders, rebate checks and refund anticipation checks. 2All checks must be made out to you, endorsed by you and drawn on a bank account in the United States or a U.S. territory. Please note that Ingo Money generally doesn't accept checks that aren't made out to you, conditional endorsement checks, counter checks, credit card checks, customer appreciation certificates, gift certificates, starter checks, traveler's checks or warrants. If your check is approved, you can get your money in minutes. When you submit a check, it usually takes a few seconds to review a check for approval, although it can take 3-5 minutes and in rare circumstances, up to an hour while Ingo Money works to verify sufficient information to approve your check. 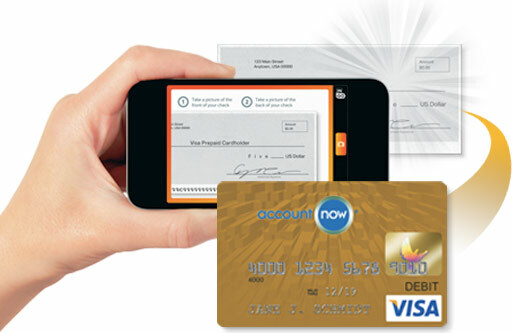 If your check is approved, your money will be sent immediately to your AccountNow Prepaid Visa Card. Fees apply for approved Money in Minutes transactions. If time is on your side, you can get your money on your card in 10 days for no fee, if your check is not returned unpaid within the 10-day period. The Ingo Money App features automatic image capture, so taking pictures of your checks is easy! First, sign the back of your check and make sure the lighting in the room is good. Then, lay the check on a solid-colored background, front-side up, so that none of the check information is covered up. Sign-in to the Ingo Money App and tap 'Cash a Check.' Tap the first check image field and position your mobile device over the check at a slight angle so that you don’t cast a shadow on the check. Fit the corners of the check inside the guidelines and watch the box turn green. (It happens quickly, so don’t blink or you’ll miss it!) Turn the check over and tap the second check image field to repeat the process and take a photo of the back of the check. If auto image capture moves too quickly for you, or your device doesn’t support it, you can take a picture manually by tapping the camera and flash icons on your screen. After you take pictures of your check, the app will display the amount of the check. Simply confirm that the amount is accurate or correct it, and tap ‘Next.’ Continue to follow the screen prompts to choose when you want your money and where you want to send it. Review your transaction details on the Confirm screen and then submit the check for review. All checks submitted to Ingo Money are subject to review for approval, and most of the checks that are reviewed are approved. There are times though when Ingo Money is unable to approve a check due to inconsistencies in check images, limit-related issues, insufficient check verification data, or information about the check writer’s account. Unfortunately, Ingo Money cannot always tell you exactly why a check is declined because privacy regulations prevent them from sharing a check writer’s account information with you. Check was not written to you, as your name appears on your Ingo Money account. Amount of the check is less than $5 or more than $5,000. Amount of the check will cause you to exceed the daily, weekly or monthly funding limits for your card. Amount of the check will cause you to exceed the daily or monthly check cashing limits or the maximum balance allowed on your card. Check images are illegible or do not pass authenticity screening. Check is a single-party check (drawn on another account you own), a temporary check, a credit card check or another unusual check type we do not support. A properly voided image of the check was not received. If you need to resubmit your voided check image, call Ingo Money at (229) 276-3990 or chat with them online at ingomoney.com. Sufficient information could not be verified on the check writer’s account. Check was written on a closed or compromised account. If your check is declined, you will be notified in the app, by push notification (if you have enabled this service for the Ingo Money App on your mobile device) and by email. Your account will not be funded, and no fee will be assessed. You may attempt to deposit or cash your check with another service provider, or alternatively contact the check writer and request a new check or a different method of payment. Why can’t I register in the Ingo Money App? You will not be able to register if Ingo Money cannot verify your identity—for instance, if your name and address don’t match or your name and Social Security Number don’t match. For more information about the Ingo Money app and mobile money deposit, visit the Ingo Money website. AccountNow does not provide and is not responsible for the Ingo Money product or service. 1There may be additional transaction, daily, monthly, and other loading limits. See your Cardholder Agreement for more details. 2All checks are subject to approval for funding by Ingo in its sole discretion. Review for approval usually takes 3 to 5 minutes but can take up to an hour. Unapproved checks will not be loaded to your card.